Published by the DOI Departmental Consulting Archeologist/NPS Archeology Program, National Park Service, Washington, DC, July 2004. Figure 1. An Army Corps (WES) stabilization project using logs cabled in place and revegetation planted on bankline. 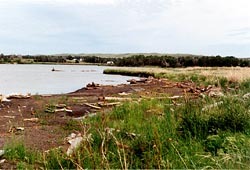 Lake Sharpe, South Dakota, June 1994. Federal laws and regulations encourage preserving archeological sites in place when they are threatened by roadbuilding, reservoir construction, and the like.1 However, proactive managers favor the idea even when sites are not immediately at risk. Excavation is costly, with the curation of artifacts adding appreciably to the expense. A resource-specific conservation plan, carefully designed and implemented, substantially reduces management costs. At the same time, the plan can be aesthetically pleasing while serving to enhance other aspects of the surroundings. There are many alternatives one can employ to stabilize sites and shorelines (Thorne 1991). A modeled approach to developing a stabilization strategy has been devised that can be applied to any setting (Thorne et al. 1987; Thorne 1988a, 1989, 1990, 1991). In many cases, however, funds are severely restricted, and factors such as environmental compatibility and aesthetic appeal come into play. Figure 2. A beach development zone behind hay bales put in place in 1991. Lake Sharpe, South Dakota, June, 1994. An experimental program, described here, addressed these and other issues in reversing the severe erosion at South Dakota’s Lake Sharpe, which was caused primarily by wind-blown waves and the annual freeze-thaw cycle. The lack of stabilizing vegetation in the unconsolidated glacially deposited soil also contributed to the erosion. 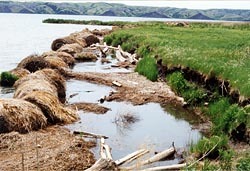 The approach, devised by the U.S. Army Corps of Engineers, uses hay bales in concert with revegetation to abate erosional forces. While not suited to every situation, this cost-effective alternative may be a low-cost solution for conservation planning. Lake Sharpe was created by Big Bend Dam, constructed in 1963 to generate electricity. Over the course of a year, the water level fluctuates less than two feet, creating a near-constant ring of erosion around the lake. Lake Sharpe is shallow, which contributes to the severity of the waves. Ice reaches a thickness of almost three feet, and during thaw the wind drives large floes into the bank. As might be expected, the setting dramatically tests any stabilization technique other than riprap, which would be inappropriate and too expensive for the entire lakeshore. The violent combination of wind, waves, and ice undercuts the entire shore. Given the area to be protected and the almost constant loss, a cost-effective approach is essential. To armor the bank and its 200 archeological sites, the Corps instituted a stabilization program, ongoing since 1987. Though the overall program is still experimental, the efficacy of its hay bales/revegetation component has been amply demonstrated. Figure 3. A farm where hay bales were put in place Sept/Oct of 1993. Note the height of the vertical cutbanks in the background, which are common to the entire lake. Lake Sharpe, South Dakota, June, 1994. Stabilizing a shoreline with an archeological site differs very little from stabilizing a shoreline without one. 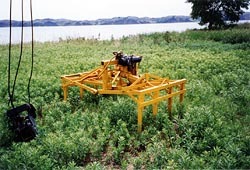 The site does create a set of limiting factors, however, that may affect the stabilizing techniques, materials, and machinery as well as the vegetation and schedule. At Lake Sharpe, the main goal of the bales was to act as a barrier. A second goal was to create a basin to trap sediment washing down from the bank and in from the lake. Eventually, the sediments solidify. Since the bales are short-lived, they must then be supplemented with other stabilization measures. Revegetating the sediment-filled basin is the least expensive and most practical. 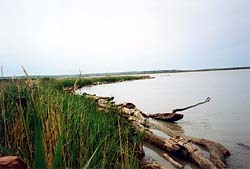 The revegetation effort at the lake–designed and directed by Hollis Allen–had already proved successful, alone and in combination with driftwood trees (Figure 1). The use of bales, which was untried previously, also proved effective. 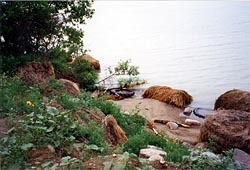 But the test setting–a relatively well protected bank sloping gently to the water’s edge–was not representative of conditions at Lake Sharpe (Figure 2). The revegetation techniques were common (e.g., Thorne 1990); their efficiency was really never in doubt. The primary purpose was to test the bales in actual conditions. Hay bales are easy to acquire. As might be expected, the quality varies. 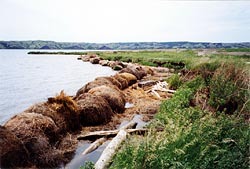 Protecting an eroding shoreline does not require feed-quality hay, but not every kind of bale will do the job. During initial tests, the bales often contained large weed stems and small sticks along with the feed grass. In some cases, the relatively poor quality reduced the weight of the bales as well as the strength of the ties holding them together. Figure 4. Commercially manufactured hay bale tongs for a crane. Were these actually attached to a crane, they would be hydraulically operated from inside the cab. Lake Sharpe, South Dakota, June, 1994. Army Corps researchers quickly recognized a bale’s ideal characteristics. Clearly, a heavy, tight bale will withstand waves better than a light, loose one. The quality of the bale depends on a number of factors–the intent of the baler, the type of equipment, and the kind of binding. The densest bales are bound with plastic ties or wrapped in plastic mesh, but twine is better for bales in a visually and environmentally sensitive site such as this one. Tight bales resist aging and the weather, shedding water like a thatched roof. Only the outer layer gets wet during snow and rain, so rotting is less of a problem. Loose bales are more prone to come apart as they are hauled and lifted into place. Some machines roll a four-by-four foot bale, which weighs around 800 pounds; the five-by-five foot bales in our tests, which weighed 1,000 pounds, were produced by newer equipment. A bale’s weight, and stability, increases in water, depending on the depth and the amount of absorption. The bales that individual ranchers produce are generally not as good as those produced by commercial operators. This is probably because commercial bales must stand up to frequent handling. Ranchers ultimately grind their bales into feed, so less attention is paid to density and tight binding. Depending on the setting of the project, the local economy can sometimes be used advantageously. In the case of Lake Sharpe, local farmers who lease Army Corps land contributed bales as part of their lease agreement. As well, the Lake Sharp example cited here is case specific, and requires a cautionary note about the acquisition of hay bales as well as revegetation materials in general. Some land managing agencies operate under guidelines that prescribe the use of weed-free plant materials. Given the number of plants that have become invasive in the U. S., this is a reasonable requirement. In California, star thistle has rapidly spread throughout the state, while the northward spread of kudzu appears to be limited only by cold climates. In the southern U. S., Johnson grass is excellent livestock feed, but is an introduced species that can be rapidly spread by both seeds and rhizomes in hay bales or by farm machinery. Site stabilization projects that include the use of introduced plants should be designed with the assistance of a botanist or plant materials specialist who is familiar with local vegetation, invasion species, and agency specific planting guidelines. As a general rule of thumb, however, if a botanist is not available, both hay bales and other plant materials should be gathered as close to the use area as possible. This approach will help minimize the potential introduction of non-native species. Commercial nurseries are alternative sources for plant materials that are free of invasive species. In some areas, livestock feed suppliers can provide certified weed-free hay. Figure 5. An Army Corps "shop built" barge for use with an airboat to place bales. Lake Sharpe, South Dakota, June, 1994. Most of the bales at Lake Sharpe were placed slightly opposite vertical banks, up to six feet high (Figure 3). Because of the near constant water level–and the lack of ebb and flow–there were few beaches to use as staging areas. Initially, the bales were lifted from the top of the banks by a crane or a dragline fitted with a clamshell bucket or specially designed clamp (Figure 4). To create the basin trap, the bales were placed away from the bank. This also left space for the vegetation. The bales need not be a specific distance away; placement usually depends on practical rather than technical considerations. At Lake Sharpe, they were usually placed about six feet out. To some extent, the distance depends on the stability of the shore and the type of equipment available. Light equipment can be used if the area fronts a dry beach; heavy machinery needs a more stable surface. There is no recommended spacing between bales but eight to twelve inches is common. This allows the small, suspended particles of sediment to flow in from the lake and, to bind with the larger particles washing down from the bank. For the Lake Sharpe project, a barge was designed to place bales in areas not accessible from the bank. 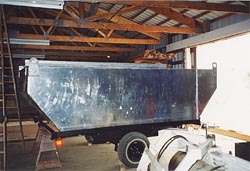 This small, light, shallow-draft vessel, which was transported easily by trailer, also could be pushed or towed by boats with small motors (Figure 5). People wading alongside maneuvered it into position; a hydraulic lift dumped the bale in front of the vessel. Buffering is only the first step in stopping the undercutting and slumping of the bank. Since the bales are short-lived, they must be supplemented and ultimately replaced. Vegetation is the best option in terms of cost, effectiveness, and compatibility with the natural environment. The merits of vegetation management have been discussed elsewhere (Jones 2000, Thorne 1990), along with various field techniques (Allen and Klimas 1986, Gray and Leiser 1989, Schiechtl 1980). Figure 6. A stabilization at the Fort George Game & Fish Commission (with no Army Corps involvement) attempted to use tractor tires and hay bales. Note the sand buildup behind the center bale. Lake Sharpe, South Dakota, June, 1994. The choice of species should be appropriate to the setting, and frequently must follow pre-existing guidelines. In most cases, indigenous vegetation is preferred because it will not out-compete existing species. Gathering plants locally can reduce the costs, and failed transplants are easily replaced. However, nursery stock, though more expensive, is hardier and thus stands a better chance of surviving. Particularly if the revegetation includes multiple species, especially non-woody varieties, a nursery may be the best source. Make sure, though, that the stock is delivered and planted promptly, with ample time to get established before the onset of harsh weather. Sources for stock can be found through local Natural Resource Conservation officers or ads in trade publications. The vegetation, whose root mats minimize soil loss, is just as important as the bale barrier in arresting the erosion. Generating a stable revegetation zone, however, depends on the inflow of sediment. From this perspective, a high amount of sediment in the water will prove advantageous. Lake Sharpe has a low amount, so the basin was filled primarily by erosion from the bank. It appears the erosion will slow as the slope of the bank and the basin reach equilibrium. The vegetation maintains the slope. As is the case with all stabilization techniques (Figure 6), no one approach is appropriate for every setting. This technique was not suited to the entire shoreline; in some places the bank was too high, in others the water too deep. Normally, the harsh environment may have disqualified this approach. In this case, however, it provided an excellent testing ground for developing and refining the technique. Winter temperatures are well below freezing, and the lake freezes to a depth of over three feet. This is not particularly destructive in and of itself, but during spring strong winds drive broken pieces of ice into the bales. At the least they could be pushed out of alignment; at the worst destroyed. Figure 7. A south-by-southwest view of the farm. Lake Sharpe, South Dakota, June, 1994. In areas protected from ice, the bales remained stable and a beach zone developed behind the barriers as predicted. No bales were shifted by wind or waves generated by either boats or the weather (although most sites were too shallow for large vessels). In one place, the bales were in disarray because they had been dumped at random over the top of the bank; even so, they still trapped sediment. There have been no complaints that the barriers are unsightly, nor have any been vandalized (Figure 7). Less than a year later, fish were spawning in the basins; a mallard and her hatchlings were using one as a refuge. Even though some slumping continued, grass was growing in large patches. The benefit to the environment cannot be overemphasized.